If you’re a product person who is building a product to get more people to use it and use it more often, this is a book you’d want to keep a copy on your desk. 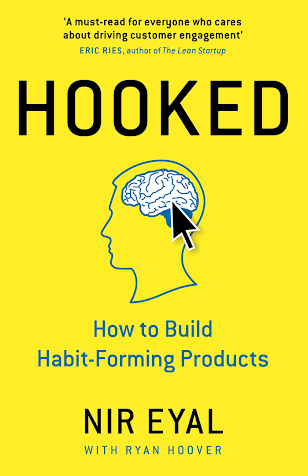 If you’re a smart phone user who checks certain apps quite regularly that you’d even refuse to admit you’re addictive to it, this a book to help you understand how it was engineered to keep you hooked. 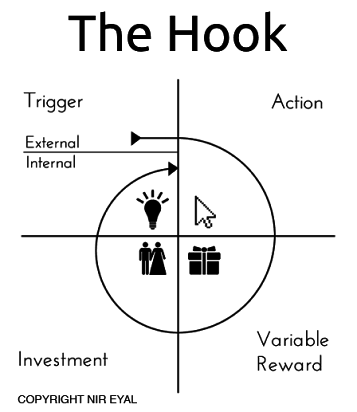 I read this book at the right timing and I wrote at length in my company’s internal blog: my reading memos and summaries of the four core parts of the idea: Trigger -> Action -> Variable Reward -> Investment, with case studies of the product I was building. Trigger: What nudges the action? Action: Which part is weak to provoke the action? Lack of motivation or the process is too hard? Reward: Is there an instant and variable reward when the user performs the action? Investment: When are we asking them to invest, and what value we give back in return? Flipping through the pages again, I found lots of post-its I attached in the book saying “I disagree,” and listing all the obvious counter-arguments. Yet still, the overall reading experience was great👏! It set the scene properly for you to deep dive for an extended period of time, so it naturally stimulates you and inspires you to think about your product’s problems and solutions. In that sense, I enjoyed the knowledge it provided and all the thoughts it provoked. It felt like taking apart a product and putting its components on the table, so you’ll be able to visualize and identify the habit-forming product’s system, the blueprint, or even the traps. Fogg (a famous guy in this field) describes that the required ingredients to initiate any actions can be written in the equation of B = MAT (Behavior = Motivation + Ability + Trigger), so-called the Behavior Model. So, what are you going to do with this piece of knowledge? There is also a chapter dedicated to the ethical discussion. I felt the view of trusting people that they won’t do evil is naive though, and if you want to read more on this subject, I’d recommend another book Irresistible that is written from the opposite perspective. Still, changing people’s behaviors is hard, reading this book won’t promise you the dreamland. But that doesn’t mean the knowledge is useless. The best way to take most out of it is to share your learnings with your team, adapt the vocabularies to better communicate, take your product on the map and analyze each aspect, do the case study of other popular products with high user engagements and try out your ideas and solutions. It is fun and rewarding. There is a 13 minutes video to get the brief idea of the framework, but I’d say don’t cut the corners and read the whole book if you truly want to learn more. You’ll get the bone and fat, you may love the fat or trim it off eventually, either way, it would be a great learning process.